Georgetown native Artishia Mae Conaway Stephens finally has her Tuskegee Airman wings. 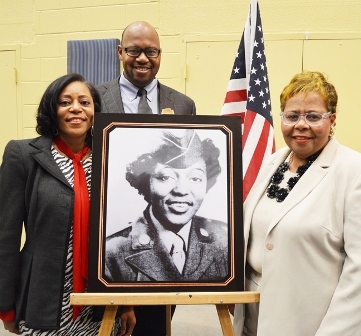 Seven-plus years after her death at age 87 in June 2011, Ms. Conaway Stephens — who served in the U.S. Army/Air Force from 1945-49 — posthumously received the Congressional Gold Medal, the nation's highest distinguished civilian award, during a luncheon ceremony Saturday at the CHEER Community Center. Family members, including daughters Marcealeate Ruffin of Georgetown and Stephanie Stephens of Claymont and grandson Robert Ruffin Jr. of Boston, accepted the Congressional Gold Medal presented by U.S. Rep. Lisa Blunt Rochester. The medal recognizes Ms. Conaway Stephens being officially vetted as a documented original Tuskegee Airman. A graduate of Howard High School in Wilmington and the Berean Business College in Philadelphia, Ms. Conaway Stephens served in the U.S. Army/Air Force from 1945-49 as a clerk-typist/stenographer. She was assigned to the 99th Squadron, a division of the Tuskegee Airmen commanded by the late four-star Gen Benjamin O. Davis Jr. She attained the rank of staff sergeant. The Tuskegee Airmen, often called the Tuskegee Experiment, was an Army Air Corps program to train African Americans to fly and maintain combat aircraft. The Tuskegee Airmen were the first African Americans who were pilots, navigators, bombardiers, mechanics, ground crew, flight instructors and support personnel who kept planes in the air and in service. After military service, Ms. Conaway Stephens worked for 39 years as a state of Delaware employee, for many years as secretary at the William C. Jason Comprehensive High School in Georgetown, and after that school closed as a bookkeeper at Delaware Technical & Community College's Georgetown Owens Campus. Tuskegee Airmen served during an era of racial inequality. A Tuskegee Airmen battle cry is that before the Air Force shattered the sound barrier, these airmen shattered the race barrier. Retired USAF Brig. Gen. Ernest Talbert of the John H. Porter First State Chapter said Artishia Stephens’ story is truly remarkable. Rep. Blunt Rochester filled with emotion during the medal presentation. Recognition of the Tuskegee Airmen reached a high point Feb. 28, 2006, when the U.S. House of Representatives passed a bill to award the Congressional Gold Medal to the Tuskegee Airmen, the largest group ever to receive the award. On March 27, 2006, the U.S. Senate unanimously passed legislation, authorizing then-President George W. Bush to award the Congressional Gold Medal to the Tuskegee Airmen. Dr. Reba Hollingsworth, who was a teacher at the William C. Jason High School, shared some remembrances. “Artishia Stephens was a professional all the way, a no-nonsense secretary who was dedicated to the students, the faculty and the community. She was the liaison between the administration and the faculty. Artishia Stephens was one of a kind,” said Dr. Hollingsworth.